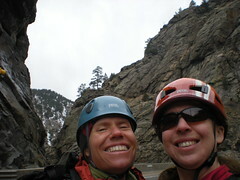 On Wednesday, Jenny & I took a midweek breather at High Wire Crag. Turns out there were 6 other people who did the same…for a warm spring day, I was not surprised! We climbed Nickels and Dimes (5.8*), then Pony Up (5.8*), and finished the half day on Stone Cold Moderate (5.7**). Great day of climbing. Jenny learned how to clean anchors; a real accomplishment. It got really cold around 2pm, so we decided to leave. Munching granny smiths on the way back to Denver I thought, “I can’t wait for summer!!!”. From the smile on Jenny’s face, I think she was feeling the same. Climbing on Real Rock is the Best!!! Emma is gone for the week, out in SoCal for spring break. Thus, Dennis & I decided to take a trip to Steamboat Springs for a nice long weekend getaway. We were hoping to ski, but warm 50+dF weather made the snow slushy. Dennis went skiing for one day, and I slept the day away. How luxurious!!! Instead of writing about how wonderful the snow was (it was not! ), I’m going to tell you about three nice places to eat in Steamboat Springs. Great place for lunch, Old Towne Pub, I ordered a Turkey Burger (yum) and Dennis got an Elk Sausage (also yum)! For desert, we could not resist the Beignets. The best Hollandaise Sauce I’ve ever had at Creekside Cafe & Grill . Dennis & I went to breakfast there, and it was awesome. This place is cozy, warm, and inviting. The service was excellent (which I can’t say for the entirety of Steamboat…) as well. I had the Eggs Benedict “Frenchman”-which came with turkey & melted brie. Dennis had the Fourteener; standard meat along with two huge buttermilk pancakes. I also had a mocha and it was very yummy. Wonderful Asian Cuisine was found at Noodles & More Saigon Cafe. We actually went back for a second night, so Dennis could sample the curry as well as the pad thai. He found the latter a better dish, but I am head over heals in love with #17 and a side of steamed veggies (to add into the chicken pho). Well there you go, my review of Steamboat Springs cuisine. On Monday, Dennis & I went for a really wonderful run alongside the Yampa River in Steamboat Springs, CO. I ran for around 8 miles, Dennis cut it off around 6. It was perfect weather for running, mid 50s. The only gripe I have with the trail (which skirts the edge of Steamboat) is the length of the trail. I wish it were longer! I didn’t take any pictures as I don’t like running with anything I have to hold (and I didn’t take my camelback). I guess you’ll just have to go up there and check it out for yourself! On Tuesday, the Denver Metro area was inundated with a horrible winter snow storm. The snow was blowing sideways in a huge white-out! I went home early, just before the weather landed and finished the day by working from home. The next day, the snow continued into mid morning. Then, the glorious sun came out. Emma & I decided to go for a snowshoe hike. We hiked for about 3 hours, all over Stapleton, and I actually got a sunburn! Emma had hoped the Coldstone was open, but alas, they had closed up shop for the day on account of the storm. We went to Noodles & Co, and I bought her a cookie instead. It wasn’t ice cream, but oh well! After 3 hours of snowshoeing, I was beat. What a great workout! On Sunday, I joined Rob & Kemp for a nice 1 hour 50 minute run around Golden, CO. The day was of the beautiful bluebird spring-like variety. It was a good day to be outside. I don’t know how far we ran, I only know we covered topics such as March Madness, running with track clubs, sandbaggers, and the book EPIC. Nice variety of conversation, I thought! I wish I would have arranged a day of climbing in the great outdoors (instead of the 4 hour gym session soon to follow). Oh-well, I never dreamed it would turn out to be so nice! I ended up running in a tank and had to roll up my pants…a sure sign of spring! You are currently browsing the climbergirl blog blog archives for March, 2010.